Coco Nebulon takes the mic as she tries to stay focused on the battle at hand. She will probably be distracted all the time by all the shiny lights and her girlfriends calling her on her cell. The Coco Nebulon Announcer can be activated from the character select menu or the in-game menu. Activating this Announcer will replace the default announcements made during regular gameplay with a whole new set. 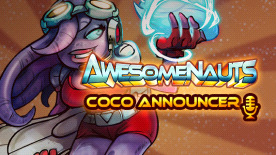 Requires [Awesomenauts](http://www.greenmangaming.com/s/gb/en/pc/games/indie/awesomenauts/) (base game) to use this DLC.